Why shoot the Tiger, the man was already dead!!! If the idiot chose to enter the cage with the tiger to die then let him. Why punish the tiger? How many more animals have to die for peoples stupidity & cruelty. Who would expect not to come out second best with a tiger, absolutely appalling another innocent animal dead. 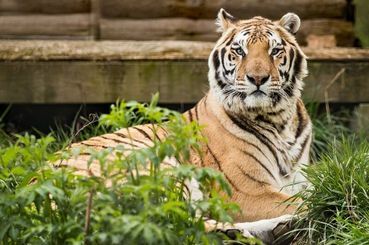 The guy shouldn't have been in the enclosure, so why shoot the tiger? He didn't do anything wrong. And why, oh why, do they shoot to kill when they have the option to tranquilize them? We need to get rid of zoos. How many others are murdered by invaders in their enclosure? Its unfair that any animal has to pay with their life for the STUPIDITY of humans! !